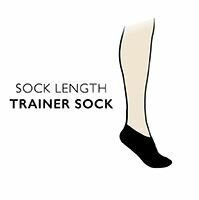 This Cotton-rich trainer sock is perfect for the gym, the tennis court or just running for a bus. A cushioned sole gives added comfort all day, so your feet stay supported no matter how hard you play. Arch support keeps aches and pains away, while the ventilation top allows fee to breathe, creating a healthy environment for your feet. Smart, casual and practical, these smooth touch socks are the ideal addition to your gym kit.